Greeting card reproduced from an original painting by Eric Ravilious. 175 x 125mm with off-white paper envelope. Published by Canns Down Press. From a watercolour on paper, 1935. 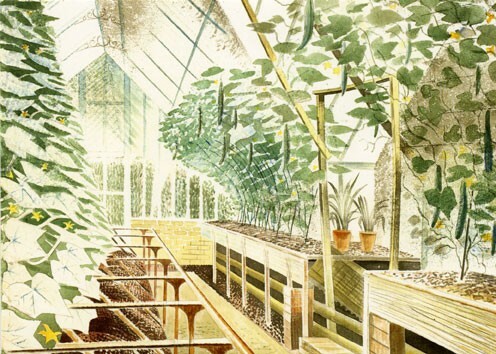 Ravilious enjoyed painting a number of watercolours of greenhouses. This painting exhibits a soft, gentle beauty and is fairly light in tone.